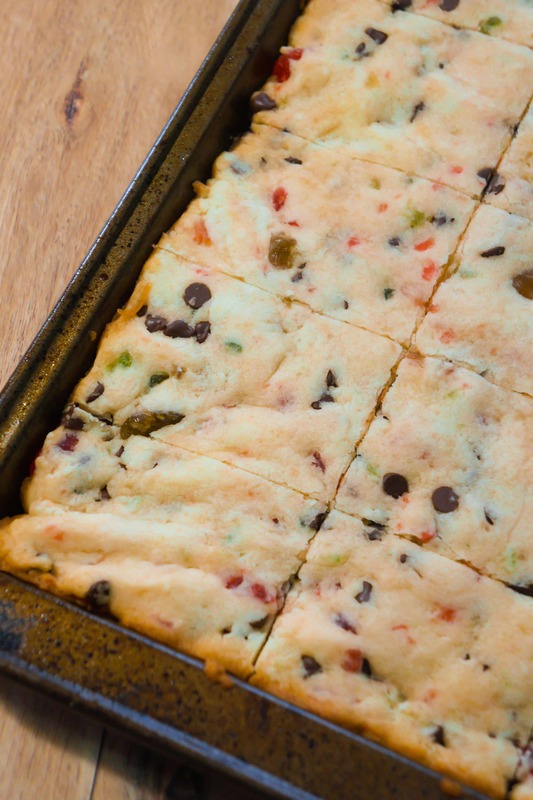 Cherry Chocolate Chip Shortbread Cookie Bars are an easy Christmas dessert recipe. 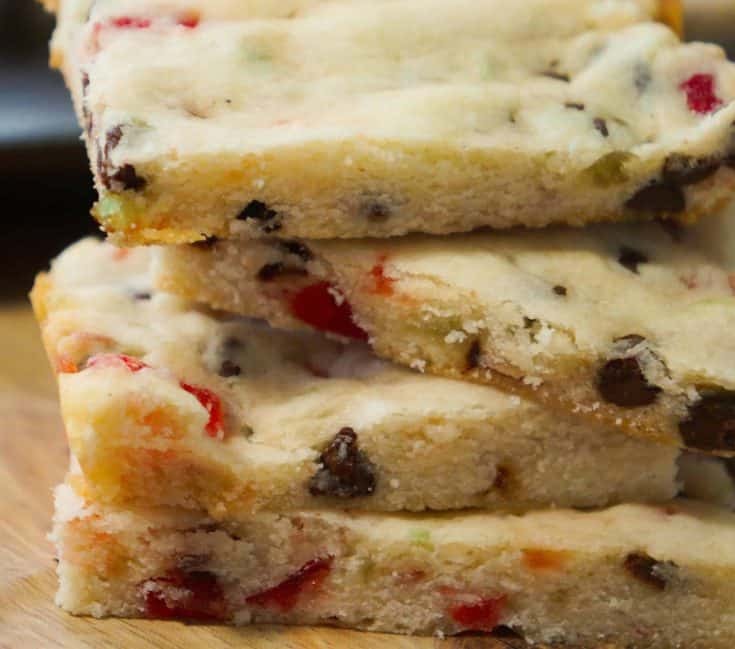 These delicious cookie bars are loaded with colourful red and green cherries and mini chocolate chips. 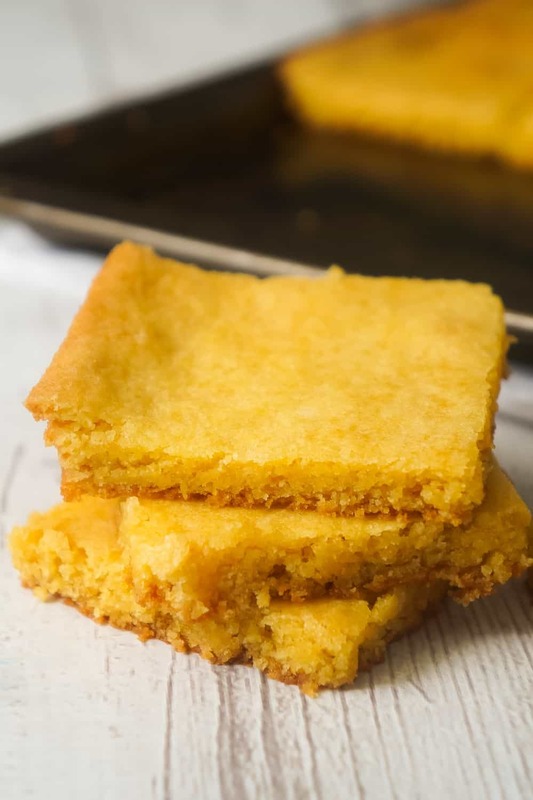 This shortbread cookie bar recipe recipe is a simple twist on traditional shortbread cookies that does not require chilling and slicing the dough. I’m so excited that Halloween is over and now I can start planning all my Christmas baking. These shortbread cookie bars are the first Christmas treat I wanted to try out. I love traditional shortbread cookies but wanted to try something more simple and festive. I started by creaming together some softened butter and egg whites with an electric mixer. Shortbread cookies don’t usually contain eggs but I needed something that would hold the bars together when they were cut after baking. I used the egg whites only because yolks have a rich flavour that would overpower the shortbread. Once the butter and egg whites were combined I added in flour and icing sugar. I continued mixing until a nice dough formed and then poured in some diced red and green cherries and mini chocolate chips. I pressed the mixture out evenly onto a greased cookie sheet. I greased my baking sheet with Pam Spray For Baking . The shortbread cookie bars were baked until they were just starting to brown around the edges of the pan. I allowed the cookie bars to cool slightly before slicing them. The result is a thin shortbread cookie bar with a crispy bottom and soft center. The chocolate chips and cherries add sweetness and flavour. 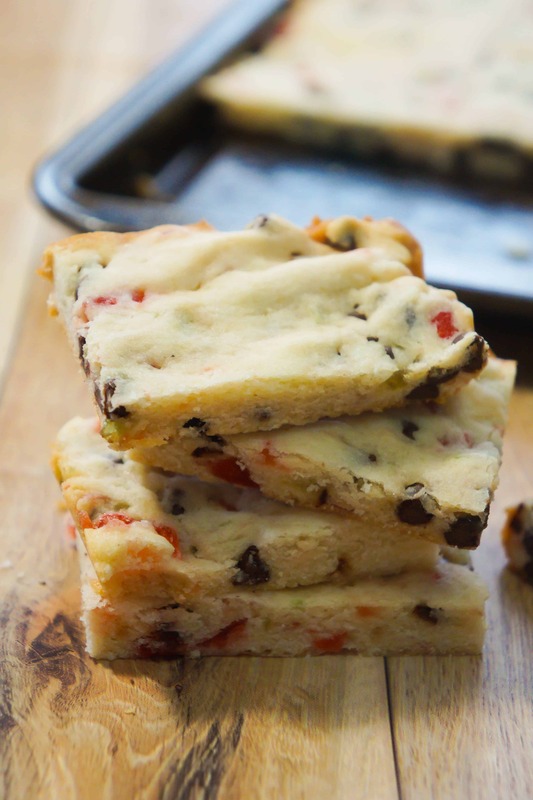 If you are looking for an easy Christmas dessert recipe you need to try these Cherry Chocolate Chip Shortbread Cookie Bars. Another amazing Christmas cookie recipe. 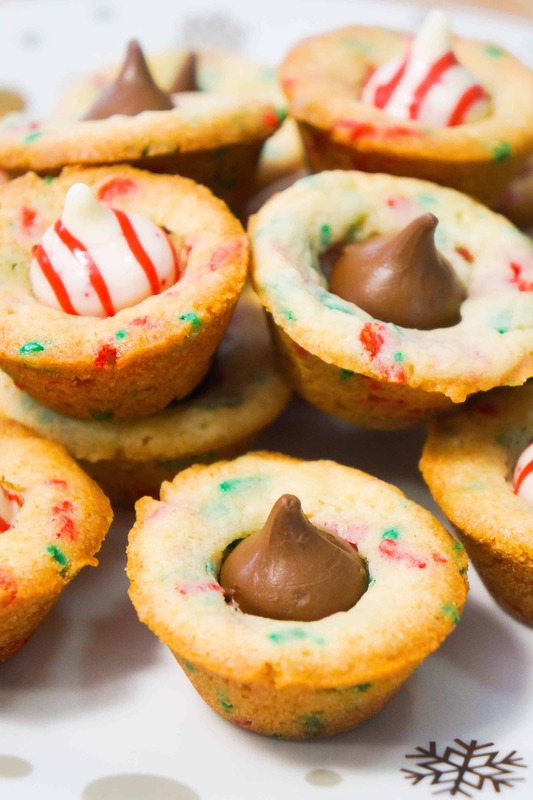 Check out these Christmas Sugar Cookie Cups! If you are looking for more dessert recipes for your holiday baking check out Peanut Butter Ritz Cracker Toffee and Easy Peanut Butter Bars. Another easy cookie bar recipe. 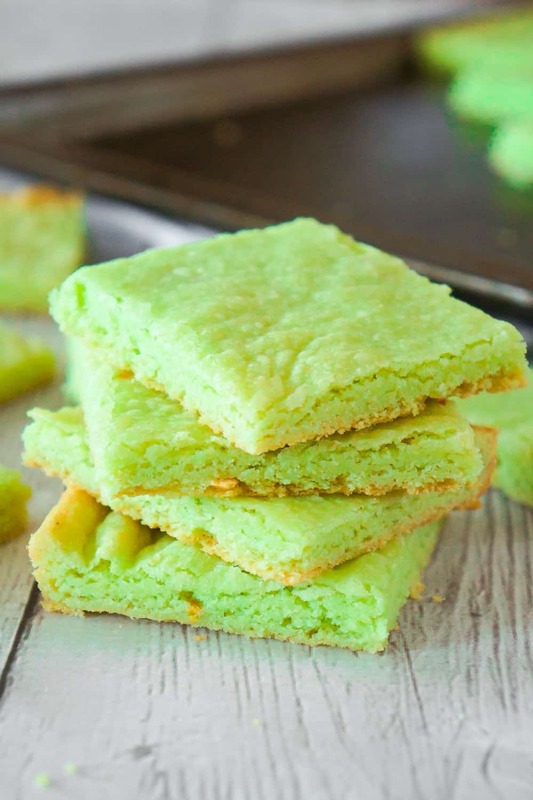 Check out these Lemon Pudding Sugar Cookie Bars! 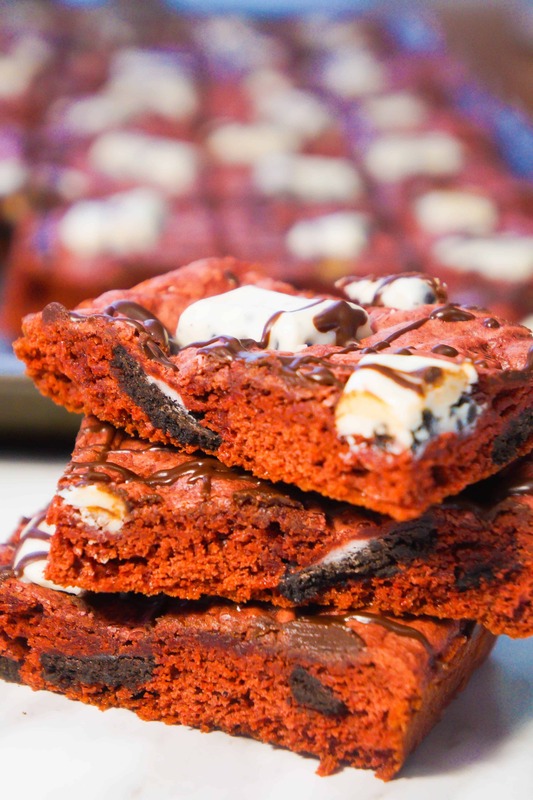 Be sure to also check out Cookies and Cream Red Velvet Cookie Bars! Another delicious sugar cookie recipe. 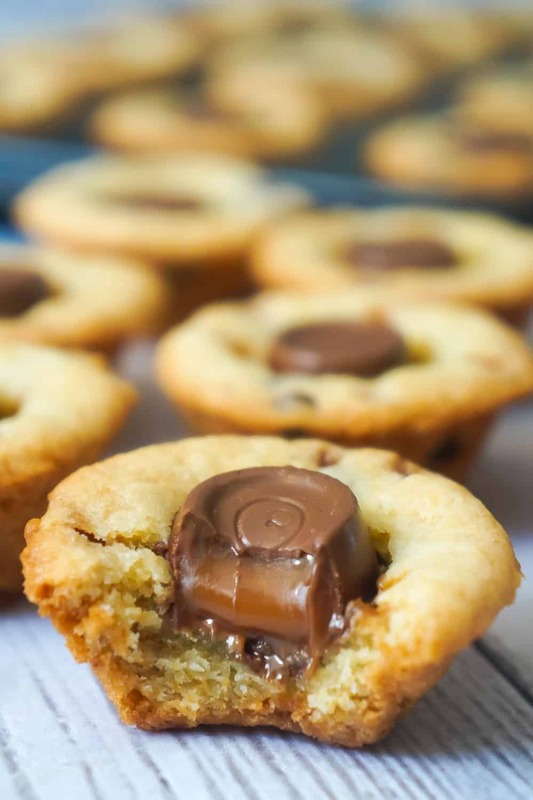 Check out these Rolo Sugar Cookie Cups! 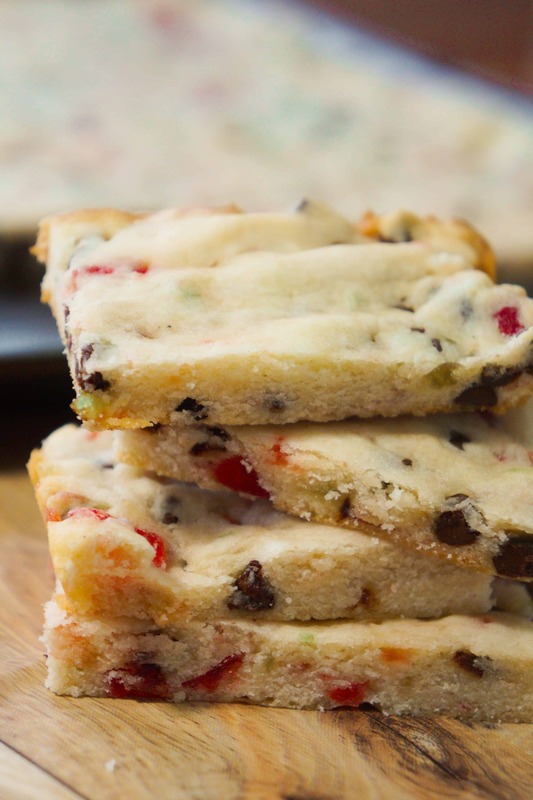 Cherry chocolate chip shortbread cookie bars are any easy Christmas dessert recipe. These shortbread cookies are loaded with cherries and chocolate chips. Add in icing sugar and continue mixing until smooth. Add flour and mix until dough forms. Stir in the diced cherries and mini chocolate chips. Press the cookie dough out evenly onto a greased 10 x 15 inch cookie sheet. Bake for 20-22 minutes until top is very light brown all over.